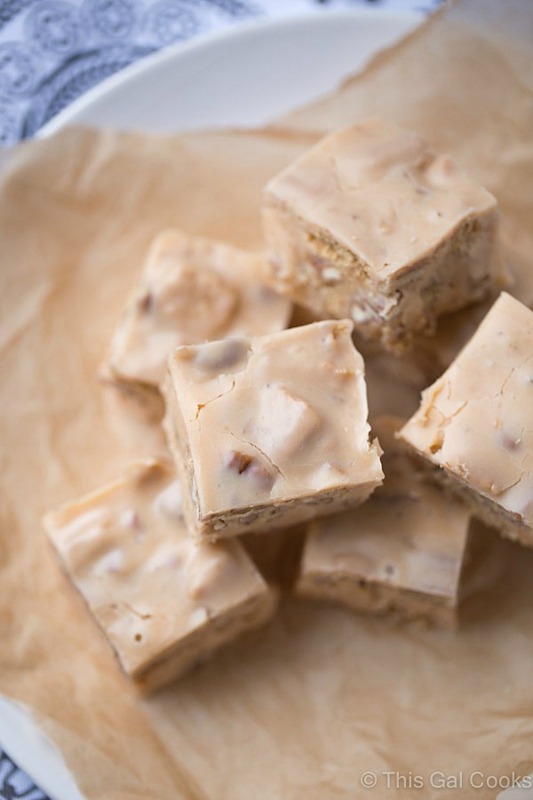 Butter Pecan Fudge. 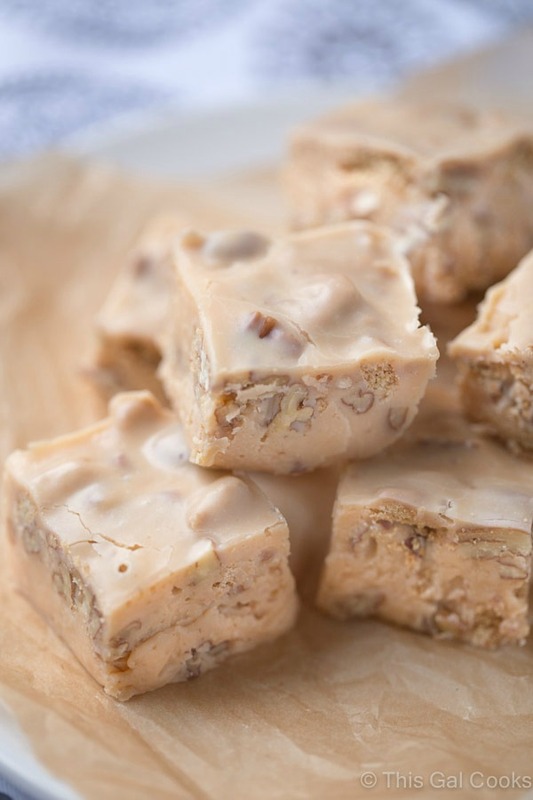 Smooth and creamy, buttery fudge is filled with chopped pecans and cinnamon graham crackers. 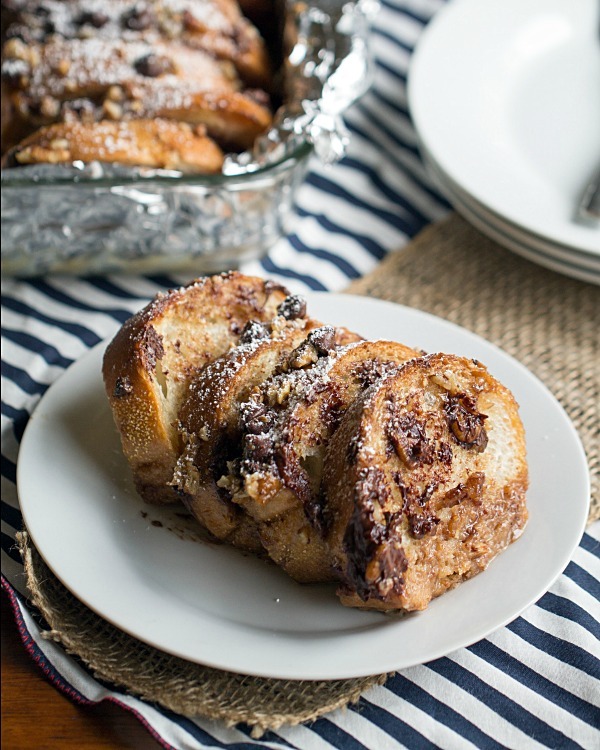 Perfect for any occasion where sweets are a must! I went back and forth about what I was going to name this fudge. First it was going to be pecan pie fudge. Nope. That wasn’t fitting for this fudge. Then I had my heart set on naming it pecan praline fudge. But then I took some to work and my friend was like OMG. That fudge reminds me of butter pecan ice cream. So Butter Pecan Fudge won. This fudge is buttery and rich, just like pecan pralines. Or butter pecan ice cream. It was an instant hit with the co-workers. Once a few had tried it, word got out about the fudge. The fudge quickly grew a fan club and then shortly after was completely devoured. I sent a batch with Ken to take to his job. I suspect the fudge had similar results at his job. He came home with an empty fudge container, too. I’ve made a few fudge recipes lately. I thought this Candy Corn M&M White Chocolate Fudge was my fav. But Butter Pecan Fudge swooped in and stole my heart. It’s sorta odd that I am totally swooning over a fudge that contains nuts. I’m one of those weirdo texture fanatics who hates the textures of certain foods. Coconut. Nuts. Fruit Peels (especially apple peels.) Seeds (ugh, raspberries, why yo seeds be so annoying?) Remember the Little Debbie Chocolate Brownies? The ones that were topped with little chopped peanuts? Well I would have been madly in love with those brownies, had they not been smothered in nuts. Seriously, I hated the nuts on those brownies so much that I would pick EVERY single one of them off the top of the brownie before I ate it. Then Cosmic Brownies entered my life and I was like DIES HAPPY! I’m no longer an anit-nutter. GIMME ALL of the nuts. Especially pecans. My fav. My heart belongs to you, pecans. And fudge. And this Butter Pecan Fudge. Line a 8x8 baking dish with enough aluminum foil to overlap the sides to create little flaps. Spray with cooking spray and wipe away the excess spray with a paper towel. Once the mixture is melted, remove from the heat and stir in the vanilla extract. Then carefully stir in the chopped pecans and then the chopped graham crackers. Pour/scrape the mixture into the prepared baking dish. Smooth with the back side of a spoon, if needed. I didn't need to smooth mine. Refrigerate for 2-3 hours, or until firm. Once fully chilled and firm, lift from the baking dish by grabbing the aluminum foil flaps and pulling out of the baking dish. Cut into squares. While heating your chocolate chip mixture, DO NOT step away from it. Continually stir. If you don't follow these two rules, you will burn the fudge and have to start over. It happened to me. I was making pizza dough while making the FIRST batch of this fudge. Stepped away for less than a minute BOOM. Burnt fudge. I had to dump it out and start over again. Store covered in your refrigerator for up to two weeks. Related posts from other bloggers. Related posts from This Gal Cooks. I have fallen in love with fudge again. I bought some at the mall a few days ago while Christmas shopping & it’s gone. Yes, im embarrassed. This looks tasty! This fudge looks so creamy and delicious! I am a sucker for fudge this butterscotch and white chocolate combo sound amazing! Love the graham crackers and pecans you added too! Thanks, Kelly! You would LOVE this fudge! Fudge is my #1 weakness so I can’t wait to get this in my belly! You are gonna love it, Pamela! Thanks for stopping by! Butter pecan is kind of my weakness Julie. If this tastes anything like the ice cream I’m in serious trouble! This fudge is definitely dangerous, Trish! Thanks for stopping by! Sounds fabulous Julie! I love that you added cinnamon graham crackers too! This fudge sounds amazing, creamy, beautiful and delicious! And I love this butterscotch and white chocolate combo! 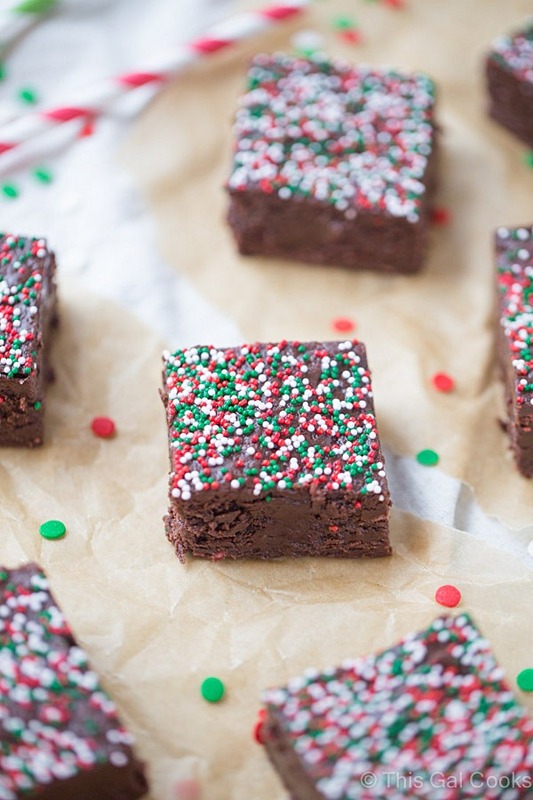 I love seeing all of the fudge recipes this time of the year. I’ve never made butter pecan flavored fudge but I am sure that this tastes amazing! This looks so yummy! I think that sometimes fudge can be cloyingly sweet and that pecans keep that sweetness in check! These are just amazing!! My FIL will love these so I will be trying it and putting some in his Christmas box. Butter pecan ice cream is one of my favorites! So good. So I’m totally convinced that I need this fudge in my life ASAP! 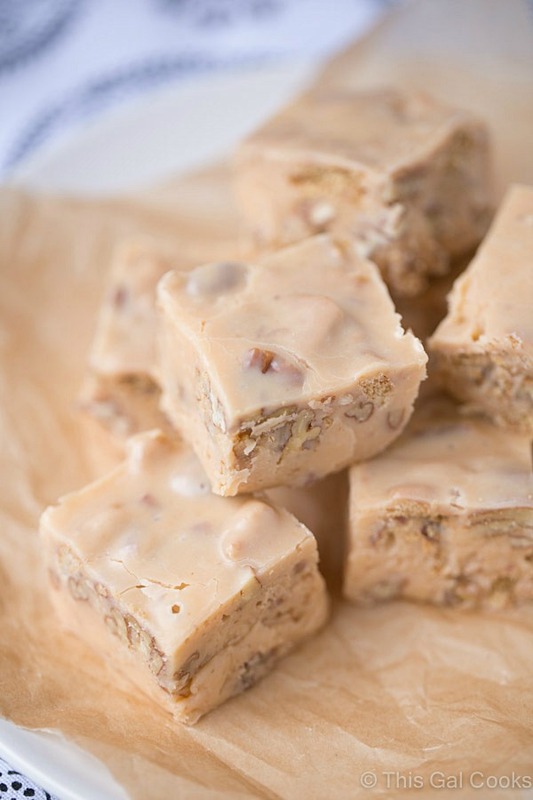 Hi Julie – Your butter pecan fudge looks fantastic, and is one of my favorite flavors! I wonder if this would still be good if I left out the graham cracker crumbs? You can leave out the Graham crackers. It will be just as good! I made this without the graham cracker crumbs and it’s Awesome!! Also, I put the chips, butter and sweetened condensed milk in a large glass bowl and microwaved for 1:30 minutes, stirred, back fior 30 seconds, stir, another 30 seconds, then added the vanilla and pecans….really came together easy, it’s crazy good….lol!